Mysteries, by their nature, are anchored in the past as they unfold in our present. Violent Spring’s genealogy goes further back than the conflagration—saigu, to use the Korean term that arose then—that erupted that particular afternoon in Los Angeles 20 year ago this April 29. About a half hour after midnight on March 3, 1991, Rodney King (on parole for an armed robbery jolt) and his passengers Bryant Allen and Freddie Helms—after drinking celebrating King getting construction work again—are stopped after what was initially termed a high speed chase of over 100 mph beginning on the 210 Freeway in the San Fernando Valley. King’s car was a 1988 Hyundai Excel—compared by car aficionados to the despised Yugo—and in subsequent reports, the LAPD estimated the speed at around 90. The two Highway Patrol officers who initially flagged the speeding car were a husband and wife team that pursued King and company off the freeway into the Lake View Terrace residential area where he eventually came to a stop. He’d bolted because he was on parole and fearful a DUI would get him locked up again. By then the LAPD had joined the chase. While the two passengers were secured in the backs of patrol cars, King is subsequently beaten by baton, kicked and tasered. It just so happened that nearby apartment resident George Holliday had gotten a new video camera and was learning to use it. As he heard the cars screeching to a halt and choppers swooping in overhead, he went out on his balcony and, getting his zoom function adjusted, taped King’s beating. Fourteen months later, the four principal LAPD officers in the case on trail for criminal misconduct were found not guilty—except in one count of excessive force—by a jury in Simi Valley, home of the Ronald Reagan Library. This was around 3 p.m. By dusk, at the corner of Normandie and Florence in South Central L.A., the violent reaction to the verdicts erupted and spread. By May 4th, with the National Guard and their tanks on the streets, a relative calm is restored. On May 9th, the Guard is sent home. Fifty-three people were dead, more than 9,000 arrested, and millions of dollars in property destroyed or stolen. At the time, I was the outreach director for the Liberty Hill Foundation, an entity that, then and now, funds community organizing, particularly in the hard-hit parts of town where the rioting occurred. Growing up in South Central, my background included being a community organizer on a variety of issues, including police abuse and renters’ rights. My job took me all over the city in all kinds of neighborhoods meeting all sorts of people. Yeah… a damn lefty, but a lefty who read Hammett, Macdonald, Goines, and devoured those Jack Kirby and Stan Lee comic books. On the second day of the civil unrest, my wife took our young kids in her family van to the Valley to stay with friends out there, and subsequently a cabin in the country. I stayed at our house in Mid-City… smoke in air, armed with my .357 and courage out of a bottle of Jack… and I was thinking this event could be a hell of a plot for a book. In 1994, as one of the directors of the MultiCultural Collaborative (there were three of us, a PC modern Mod Squad troika—one black, one Korean-American, one Chicano), begun a few months post the riots to better race relations at the grassroots and affect public policy, Violent Spring became my first published novel. Not only had I drawn on my past experiences, but my current work took me from the housing projects of Watts meeting with gangbangers, to the high-rises of downtown and soirees in Beverly Hills. This gave me my settings, and interacting with the personalities who would become my composite characters for the book. This would be the landscape my rough and tumble private eye Ivan Monk would navigate in the murder that sets the story in motion. The citizenry of South Central glanced at one another, uncertain of how to proceed. Two of the cops came forward, arms up, palms outthrust. Slowly, but forcefully, they eased the crowd back to the edge of the field. The news people protested the loudest, but they too were moved back away from the pit. Monk could see three patrol cars come south on Normandie and turn onto the dirt lot. The cars sped to where the pit was, billowing flowery plumes of brown dust. Cops exited the vehicles en masse, and some took up their command around the hole. The remaining ones formed a curtain of grim-faced dragoons between that portion of the field and the crowd. Many of the residents were already starting to leave. “I guess the show’s over for today,” Nona Monk said. She started to head toward her car, Monk and his sister following behind. “Yeah, but who did the body belong to? And who put him in his grave?” Monk said more to himself than to his family. He turned various scenarios over in his mind as they walked. The trio laughed, but Monk couldn’t help taking a last look at the field. The sergeant and another cop were down on their knees, doing something with their hands in the hole. Tina Chalmers and the others stood back, their eyes fixed on the cops working in the pit. 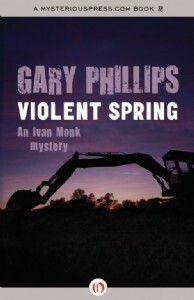 I’m very pleased that MysteriousPress.com has brought Violent Spring back in eBook format, along with the other three Ivan Monk novels. Between those books and since then, I’ve written several short stories featuring the character as well. But I miss him in long form. This look back reminds me that I don’t have to wait for another riot to come along to write another book about one of his cases. I’m going to get on that. If you haven’t read Violent Spring, I hope you’ll find it entertaining and just a bit illuminating about that time, and the timeless nature and mystery of the human animal. Gary Phillips is a critically acclaimed author of mysteries and graphic novels. 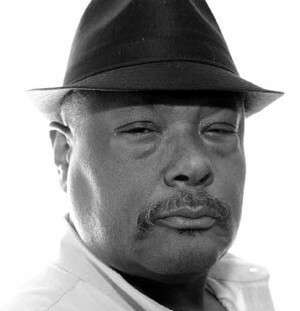 Raised in South Central Los Angeles, Phillips grew up reading comics, classic pulp and detective fiction, and the likes of Iceberg Slim and took inspiration from all this when he created his first series character, Ivan Monk, in the early 1990s. A private detective adept at navigating the racial tensions of modern L. A. and beyond, Monk has appeared in four novels and one short story collection.